If you need to communicate with a serial RS232 device then there is now an easy way of doing this wireless using Bluetooh. While serial over Bluetooth communication is not new, most serial Bluetooth adapters on the market are not very user friendly and some only offers limited features and functions. The people behind the Blutronium™ Serial Bluetooth Adapter has spent a lot of time, money, sweat and tears in coming up with the best design offering the most functions and features while still being as user friendly as possible. This has not been an easy task but the effort has been worth it! Take a look below and read why the Blutronium™ adapter is the way to go. When using a Serial Bluetooth Adapter the most used settings is usually the COM port's baud rate setting. The reason is because the baud rate of the adapter has to match the baud rate of the serial device to which connect the adapter. For this reason the Blutronium™ Serial Bluetooth Adapter has DIP switches for selecting baud rates from 1200bps to 921,600bps which makes it fast and east to set the desired baud rate. Most other adapters on the market requires the user to connect the adapter to a computer using a serial port and then send commands from the computer to the adapter to change the baud rate. This is not only a tedious way of doing this but also requires an available serial port in the computer. 1. The most used settings can be set by DIP switches on the front of the adapter. 2. All settings can be configured over Bluetooth using the free included configuration software. 3. All settings can be configured through the serial port (RS232) using the free included configuration software. Most serial Bluetooth adapters on the market have to be configured by using a 3rd party terminal program such as Tera Term or Putty; some has a simple configuration utility if you are lucky. 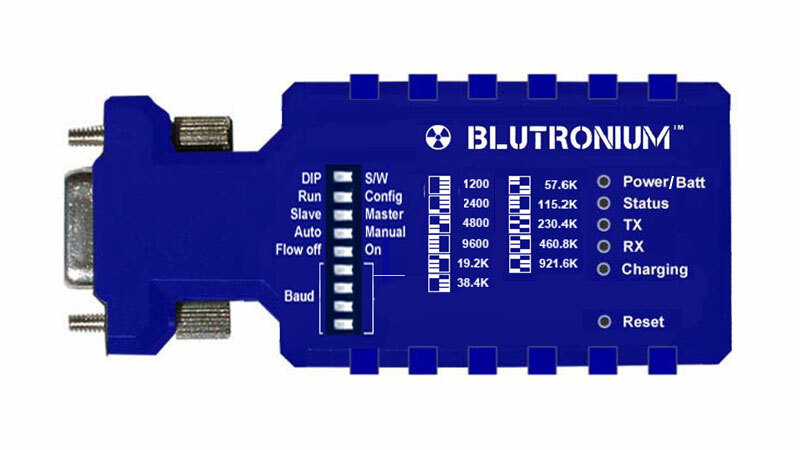 With the Blutronium™ Serial Bluetooth Adapter is included a state of the art free configuration software which can configure all the adapter's settings over Bluetooth or through the serial port. The software is easy to use with a good overview of all the available parameters and has help descriptions built-in for explaining what the different parameters do. The software works with all newer versions of Windows. We are not aware of any other adapter on the market which can be configured over Bluetooth. Configuring the parameters over Bluetooth is a huge advantage to the user since a serial COM port in not required. To make the Blutronium™ Serial Bluetooth Adapter truly wireless it has a built-in Lithium-Ion battery which will power the adapter for at least 12 hours. The battery can be re-charged by a standard USB port or standard 110VAC/5VDC mini USB power supply. Power/Batt: indicates when the adapter has power and also the power level of the battery. Status: indicates when the adapter is linked over Bluetooth. TX: indicates when the adapter transmits data. RX: indicates when the adapter receives data. Charging: indicates when the battery is charging. The Blutronium™ Serial Bluetooth Adapter is currently available with an internal chip antenna. In the future it will also be available with an external di-pole antenna for making sure the optimal communication range is achieved. The internal chip antenna is convenient if you need to use the adapter in a tight space or if the optimal communication range is not of importance. Flow control: Enables or disables the RTS/CTS handshake lines. Slave/Master: Selects if the adapter should work as a Master or a Slave adapter. Auto/Manual: Selects if the adapter should automatically with a Bluetooth device. DCE/DTE: This switch selects if the adapter should work as a DCE or a DTE device. Run/Config: With this switch the user can set the adapter into configuration mode (for programming over Bluetooth) or run mode. DIP/Software: This switch selects if the DIP switches are enabled or if the software settings should be used. Blutronium – Serial Bluetooth Adapter | Powered by Mantra & WordPress.